I just love this time of year! It’s the season of celebrations with Mother’s and Father’s Day, the end of another school year and graduations! I especially love graduations because it forces you to be reflective. Whether you are walking across the stage yourself or watching a loved one make this huge accomplishment, you pause to think about the hours of work, the stressful nights, the debates over books or politics, the moments of laughter, and the friends made. I experienced 4 graduations: 8th grade, high school, college and graduate school. 8th grade didn’t feel like a big deal; my friends and I were moving on together to high school. I am also the youngest of 4, so all my siblings had already gone through college and I spent a LOT of time in that building at their games, choir concerts, etc. High school was exciting! I was ready to move on and experience a new adventure. College was the most emotional! I knew my friends would be dispersing across the entire country, and I really didn’t want to leave them all. Never again will you live so closely with so many friends. 6 years later I still miss them! Graduate school was the one where I felt most accomplished and proud of my work, even though the ceremony itself didn’t feel necessary. All very different occasions in very different moments of my life but all of them made me look back fondly. 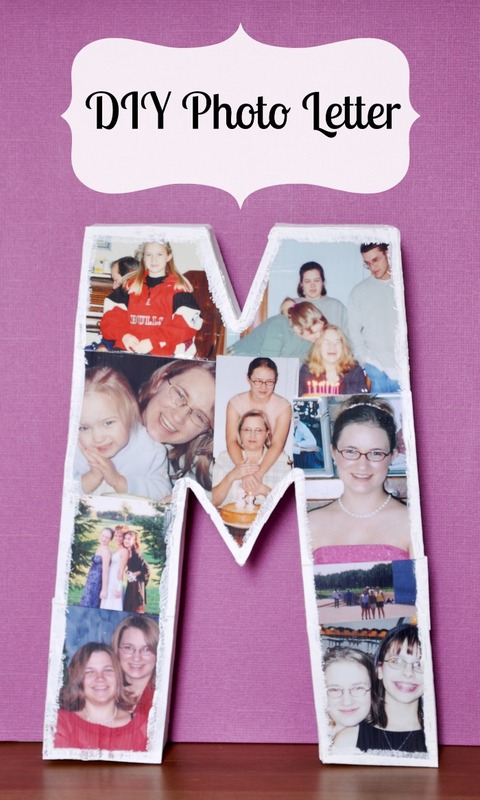 If you know a graduate this year, consider making them this Mod Podge DIY Photo Letter! 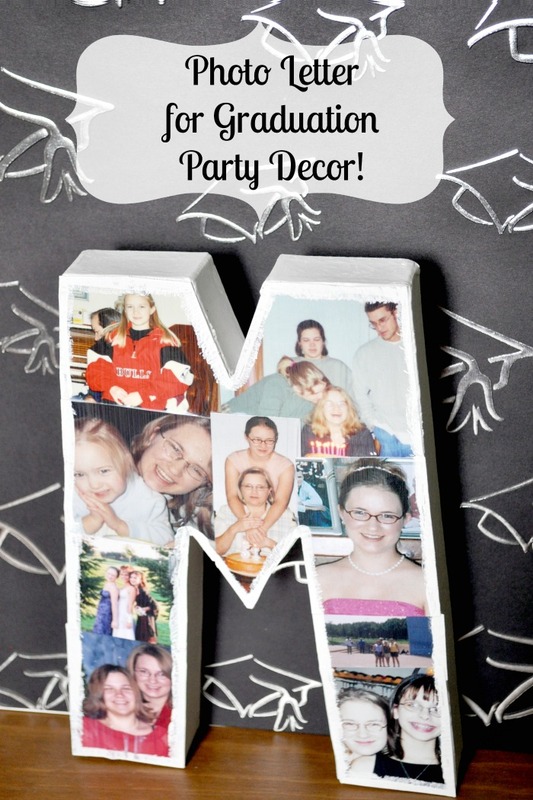 It is a fun way to display photographs at a Graduation Party, showing fond memories and good friends. This is especially perfect for high school graduates because it becomes fun dorm room decor when they go off to college. 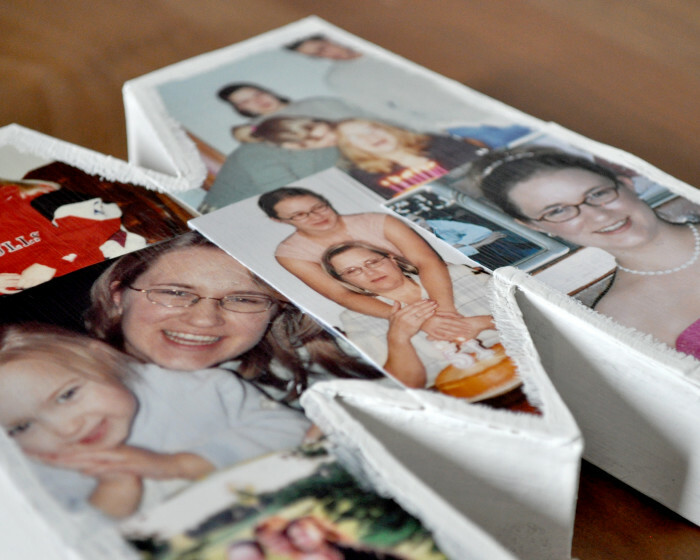 Think how much they would love being able to display their favorite pictures in a personalized manner. Plus, letters and monograms are very “in” right now for room decor! Paint your letter your desired color before adding photos. Decide which photographs you want to use for this letter. Remember that you will want photos that are farther away in scope. Most likely if they are cropped tightly on the people, it won’t fit on the letter. Start working with one picture at a time. I would pick a photo, decide where I wanted it on the letter, use a pen to make rough marks on where to trim the photo, cut it down and then attack with mod podge. I prefer having my photo trimmed a little wide when I put it on the letter because I can always trim it after it is attached but I can’t make the photo grow back. 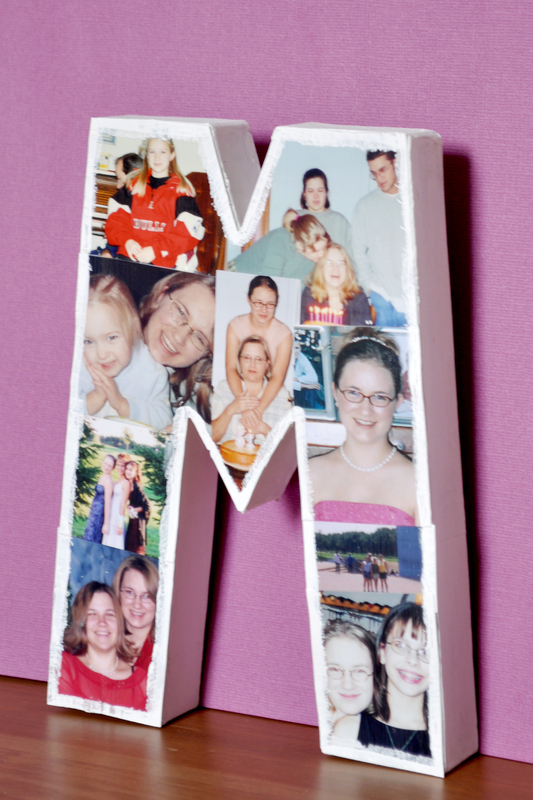 MOD PODGE: You will want a medium layer of mod podge on the letter before attaching the photo. Hold down for a minute after placement to make sure it adheres well. After all your photos are attached, check your corners and edges. If a photo isn’t attached strongly, add a little more mod podge underneath and hold. Then, add a layer of mod podge on top of the entire letter to help seal everything together! It will go on white but will dry clear. What were your graduations like? This is such a cute idea! I just stumbled upon your blog and think I could find a lot of projects here! This is a great summer craft. This came out great! I think the kids would love to make one this summer! I really love how this turned out! You are very creative! I love this idea. The letters are just so cute! I know my daughter would appreciate something like this. This might be cool at a wedding too. Nice idea, thanks! This is so cute! I might take this idea and use it to make a number for my son’s next birthday! How fun! This would be great for my girls to do in their rooms! That’s such an adorable DIY. would love to make one for each of my kiddos. This would be fun to make for our wedding reception. A collage of photos from our relationship/engagement and put them on the initial of our last name. I must try this project. I really love this idea! I can see this photo letter being a great gift for many reasons. that is awesome. I am so going to make those for my girls starting with their newborn pics to where they are at now! Great Project.. This is a fantastic idea.. This is such a cute idea! Thanks for sharing this. That is absolutely adorable I love it!! This would be such a cute gift to give someone just going off to college too! This is a fantastic idea, Nice way to save memories. I think this came out great! It does make a great gift idea too! I just love modge podge. What great use! That is so cute! I love making decorations and gifts with photos!